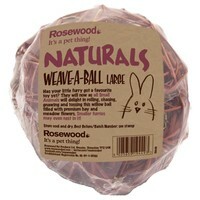 Boredom Breaker Naturals Weave 'A' Ball Large provides hours of nibbling fun for small pets! This intriguing, woven ball offers your pet vital mental stimulation as well as a means of gnawing down their continuously growing teeth. Suitable for rabbits and rodents, your pet can enjoy hours of nibbling away at the ball as they try to reach the hay filled centre!